Border control was very slow. It seemed as if they would only process one car at a time. As soon as a car came into Kyrgyzstan we were allowed into the control area. Passport control was fast but Customs filled out 3 books and 4 forms - slowly! This included an official GBAO which was not requested anywhere. I assume it was a souvineer. If I had realised this at the time I would have refused it. I had to pay extra for something I will throw away. The landscape is interesting. 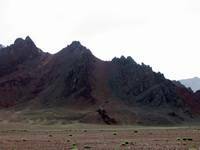 Arid and stark with multi-coloured mountains. 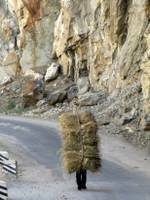 The highway follows a border fence even though China is over the mountain range all-be-it not far away. In the drive to Murgab, 188 kilometers, we passed 2 villages and 2 nomad families. That is probably all the environment can support. At the top of Ak-Baital Pass (4,655m) we met 2 cyclists and a biker heading for Kyrgyzstan. I keep saying it but I am impressed by the cyclists. At 5,000m I had trouble walking up a small hill. I couldn't have cycled. 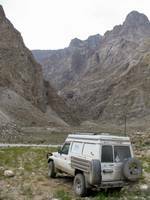 We took a short break in Murgab to use up our Kyrgyz Som. I first tried the bank where to my surprise they even changed the coins. 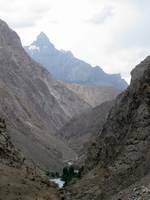 Other traveller's had told us that the Wakkan Valley was not to be missed. Again it is interesting. Perhaps we have seen too many mountains and valleys to be really impressed. 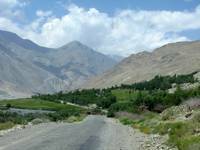 The whole Pamir Region is very arid and the Wakkan Valley is no exception. 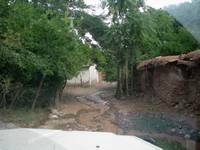 Small villages nestle anywhere that can support crops. They are few and far between. 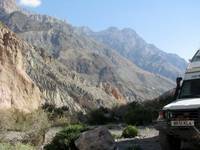 At least the road on theTajikistan side is driveable. The Afghan side only has a track in most places. Those villages are truly isolated. Our night stop was just past Langar, close to a village. Flat areas are few and far between. Some boys came to visit. They were very curious but friendly. We were invited to a home for something to eat which we gently refused. They didn't leave! We can't communicate very well either. In the end we simply ignored them. They still found it fascinating to watch though. One old man came from the village in the hope of selling woollen socks. I was sorry to disappoint him. They were quite colourful but I already have enough. The boys were back early the next morning giving us no privacy. The people along the Pamir Highway tend to be Kyrgyz with Mongolian ancestors. 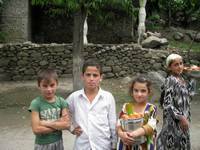 In the Wakkan Valley they have Persian ancestors and European features similar to the Afghans and Iranians. They also speak a dialect of Persian. We were heading to Khorog for the night. On passing through Ishkhashim we drove into a road block. Huge stones had beenplaced across the road. Soldiers were manning the road block from behind a wall. I got out to ask what was happening and was waved back by one soldier while the other, very nervous soldiers, trained their guns on me. Retreat seemed the best option. We headed back into the village to find out what was going on. No body knew more than that the KGB army boss had been murdered and there was fighting in Khorog. A guest house was nearby. We were not the last to take a room at the guest house.Eventually the owners had to give up one of their own bedrooms and a family room. Many people were sleeping on the floor.Part of this crowd were about 25 Geography students from an Austrian University. The atmosphere was very lively. Our hostessesdid very well financially. At least this will make up for future loss of business. 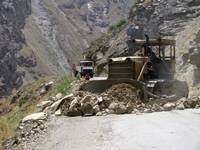 As at 1st August the Pamir Highway has been closed indefinitely. Wednesday was spent relaxing and talking to other travellers. Pieter was introduced to vodka which has become his newfavourite drink. The situation in Khorag became clearer as news filtered through.After the KGB boss was murdered the army had reacted by looking for the perpetrators. They arrested 5 clan leaders. The local people objected and started fighting the army. By evening a cease fire had been agreed and we all hoped that we could leave the next day. 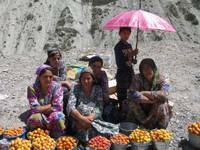 Thursday came with information that all was quiet and Khorag was open. 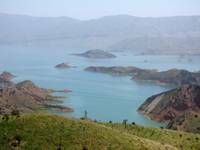 The Geography professor had been in constant contact with the German Embassy via an Afghanistan cell phone network. 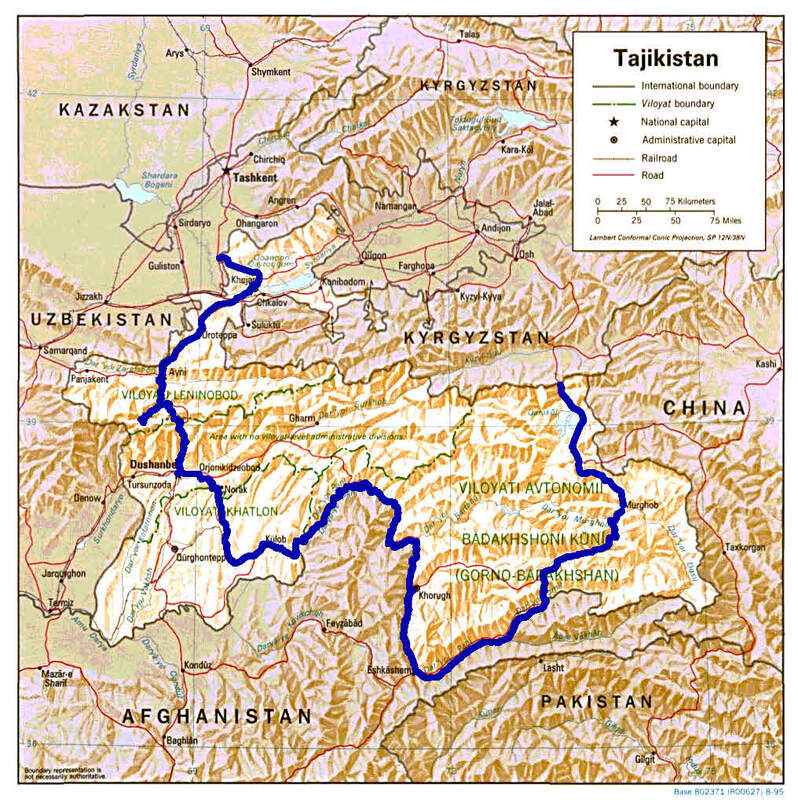 The Tajikistan network had been closed. There were 2 cars and 2 buses full of students forming a convoy. Like the army it was "hurry up and wait". Just down the road the convoy stopped. New information came from the German Embassy that the cease fire had broken down and the fighting could start again at any moment. The Austrians could not take chances with all those students. Unfortunately all roads between the eastern Pamirs and the western Pamirs lead across a bridge in the centre of Khorag.The buses turned around and headed back up the Wakkan Valley and the Pamir Highway to Kyrgyzstan. The German Embassy was busy arranging entry into Kyrgyzstan without visa. There were rumours that visa would not be required anyway. In fact Kyrgyzstan scrapped visa for developed countries from 27 July. We decided to continue in convoy with the other car. Shortly they also stopped. The car contained a small group of French travellers who had hired a car, driver and guide from a travel agency. 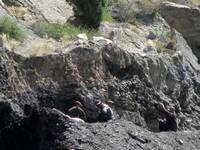 The Agency had called the guide advising him to wait for more information before proceeding. So we ended up going it alone. We only have responsibility for ourselves. In any event the army would stop us well before Khorag if there was a problem. The only risk we took was that fighting would break out while we were actually in the village. Khorag was very peacefull. There were people milling around on the streets but none seemed violent. The army was no-where to be seen, there were plenty of police though. We passed a mortally damaged tank which was being inspectedby some young men. Two trucks were on the bridge. One had a very damaged wheel, the other had the under-carriage almosttotally ripped out. Two barricades were still in place. The first consisted of large tree trunks across the road with a hundred meters between each barricade. Presumably this was set up by the army. I can't imagine the army allowing the general populace to bring in trees. The next barricade consisted of two relatively new long trucks across the road. Again with 100 meters betwwn them. This I assume was put in place by the locals. Most drivers would have strong objections if the army comandeered their truck. We could get passed both barricades. It was a little tricky but there were plenty ofother cars going through. Everyone was making use of the opportunity. The peace lasted another day before it was shattered and the region locked down. We stopped for the night along the Panj River. 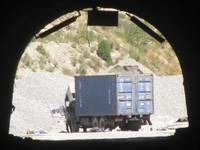 We didn't notice that there were Afghan road clearers on the other side untilthere was an almighty bang! We both jumped out of our skins expecting guns and trouble. The Afghans had just blown up a bigrock! I guess we were still a little jumpy. There were several army checkpoints along the way, none seemed concerned. The various embassies were taking no chances though. On Thursday we met a convoy going to Khorog to evacuate UN, British and other personel. Friday we passed a similar convoy for the US. They were obviously a bit more relaxed about the situation. 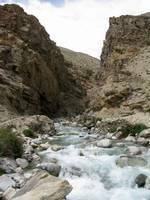 The route along the Panj River is dramatic. 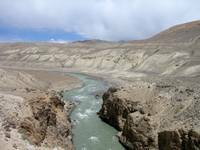 The mountains come down steeply to the river. To our eyes much more scenic than the Pamir Highway. 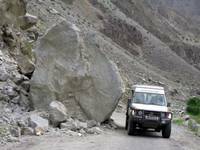 There was evidence of many rock falls along the road, including recent ones. Even so the road wasn't bad. The worst section was just north of Shuroobod. The road, if it had ever been there, was completely washed away wherewe had to cross over the delta of rivers heading for the Panj. 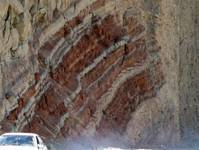 The river beds were wide, about a kilometer each! And littered with round river stones. There was very little water though, the season for melting snow is over. The road turns away from the Panj near Shuroobod. Soon after we settled in for the night. Later we were joined by another Land Cruiser and a motor bike. One member of the group paraglides. Most of his luggage is his paraglider. He actually travelsthis way at times for distances of around 150k in a day. 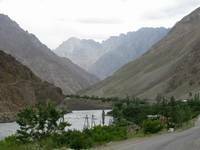 The group were hoping to go along the Pamir Highway. They intended to go until they were turned back. If this happened they would explore valleys before the turning point. We wished them well.It would be interesting to know how far they got. 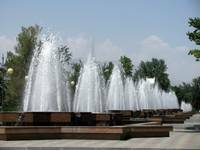 Dushanbe has many monuments and fountains. Our main task however was to sort out a visa for Uzbekistan. I knew it would take a while, butnot 3 to 4 weeks! In addition the first part, getting a Letter of Invitation, has to be done online. This includes paying for the service. Overseas payments are a pain for South Africans. We used StanTours.com. Luckily there is a hamburger placewith free wifi just around the corner from the hotel. At least communication wasn't a problem. We sped things up by applying for a Kazakhstan visa while waiting for the LOI. Now we will only need a Russian transit vissa from Tashkent. We have driven through ''The Long Dark Tunnel'. This a 4.7 kilometre tunnel on the main road north from Dushanbe. It is certainly long but they have strung up 100w bulbs a few metres apart along most of it. It is certainly enough light - if you're walking! The tunnel is still under construction. Eventually there will be a second tunnel where both will be one way. It is full of potholes. The potholes are full of water. It rains in the tunnel! Every kilometre or so a short tunnel is being cut out at right angles to the other tunnel. Some of the debris from these excavations is piled up in the tunnel, usually with a few extra lights nearby or even a spotlight. Traffic moves very slowly. It took us 17 minutes to negotiate it, 16.6 kph. Sedans have to be careful of the potholes as some are relatively deep (15 cm). Trucks avoid the potholes as much as possible as well. Every one drives on what appears to be the best sections of road unless the car coming towards them has the right to that side. This results in a lot of unnecessary weaving as one side is as bad as the other. Then there are the mounds of rubble taking up half the road. Added to all of this the road is only 2 lanes wide with very little to spare on either side. Very, very scary. All in all it was better than we had been led to expect! Before reaching the long tunnel we had some experience with short dark tunnels with NO lighting. Then when you come out of the long tunnel there is a immediate turn to the left. Straight ahead is another brown mountain wall which makes the light at the end of the tunnel seem surreal in afternoon light. Unfortunately it is not quite the same in the morning light when I took the photo. The sides of the next valley have coal tumbling down the sides. The villagers are totally involved with mining the coal. 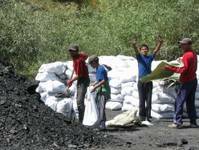 Some mining appears to be a cottage industry effort but there is also be a corporation working there. There are tunnels as well as open cast mining up the mountain sides. 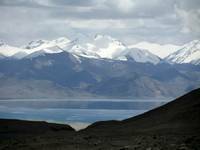 Our destination was Iskanderkul Lake. Yes, another lake set in a mountain valley. The steep sided valley to the lake is as dramatic as the other valleys in Tajikistan. The lake itself is nothing to write home about. The road clings to the mountain side to avoid going through the water. Every flattish area has been used to provide private recreational facilities. 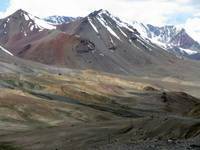 We ventured further hoping we might be able to drive to Marguzor Lakes. On the way we met a group of hikers who had come from there with a guide who had excellent English. 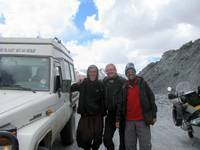 He assured us that the passes were only tracks and could not be driven along. Oh well it was just a thought. I hadn't really expected there to be a road. Instead we found a lovely spot for the night with a small stream, lots of space and plenty of wood. 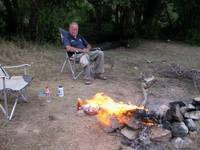 The braai was great at always. Next morning we decided to head for Marguzor Lakes the long way round. The road from Anyi was bad. The rubbers in the shocks had been replaced in Dushanbe. They came out! With no rubbers, we had to turn back. We had them fixed in Anyi, where the mechanics did a much better job. Hopefully they will last until we can get to a country where they have the machine to do the job really well. By this time it was well after lunch and the thought of driving along bad roads just did not appeal. 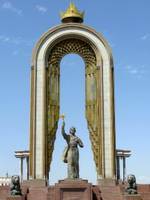 Instead we headed for Dushanbe. The road is good except for the long dark tunnel and we made it by dinner time. We even went back to the room we had had previously. In some ways it was nice to be back in familiar surroundings, but the Fan Mountains were a lovely interlude. On Monday, the earliest possible time, the Letter of Invitation arrived. Tuesday we went to the Uzbek Embassy. I was expecting this to take a week to 10 days. It took 3 hours! A German couple came in and they will get their visa in a week - without an LOI!! We could have skipped the LOI, with the attendant cost and received the visa in the same timeframe! Pity the English at the Embassy was not good enough to tell us this. Pieter is busy writing a novel so we decided to stay an extra day before moving on to Tashkent. At least I updated the photos on Facebook for the last 18 months. 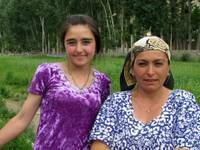 The women in Tajikistan wear a version of the Pakistani shalwar-kameez. The dress in much longer, down to the ankles. It is also much fuller so splits in the side are not required. The material is usually quite colourful. The younger women tend to have shorter more form fitting dresses. Scarves are not very common. I my opinion the Pakistani version is much more elegant. The men, of course, wear western dress. Many people have eyebrows that almost grow together. Some older women enhance this look with make-up. Looks a bit strange to me. Gold teeth are also very common in both men and women. The number of gold teeth range from one or two to a full upper mouth and/or lower mouth. The weather is hot, over 40 degrees Celsius. And Ramadan in not much in evidence. Third time through the Long Dark Tunnel and it really is not so bad. This time the lights were out and there was hardly any traffic. We could see much better with just the light from our headlights. The bad patches are not quite as bad as we thought and the good patches longer. Familiarity breeds contempt! We had a laugh about the gradient signs on the road. Most said 12 degrees but were defintiely a lot less. Then we came to a 10 degree sign. This slope was definitely a lot more. 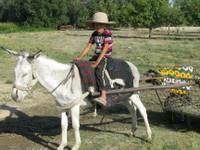 In Tajikistan donkeys are used for transport unlike in Kazakhstan and Kyrgyzstan. 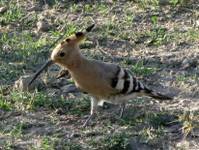 We have seen many Hoopoe. These are common in South Africa but slightly different as the South African ones have darker brown feathers including on the legs.